Welcome to St. Brendan’s Youth Faith Formation program. Our department offers classes, programs and Sacramental preparation for all children and youth, ages Kindergarten through 12th grade. 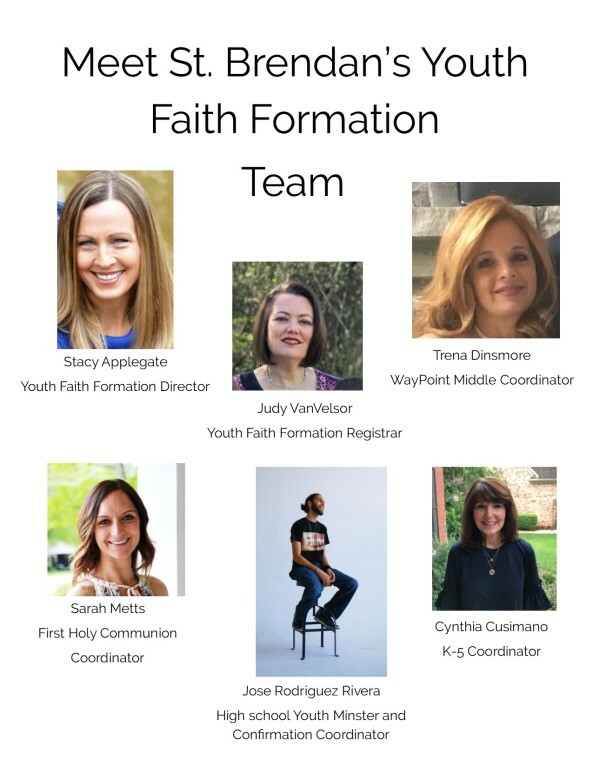 We welcome the opportunity to offer your family a variety of faith formation options, as well as support from our Youth Faith Formation team. Our mission is to partner with you, as the primary educators of your children in the Catholic faith, to engage, evangelize, educate and inspire your children to a deeper and more personal experience of Christ’s love for each of them. We use resources and structure that are in compliance with the guidelines of the Archdiocese of Atlanta. Questions??? Need Help with the 2019-20 online registration process that begins on March 30? Please call our office and schedule appointment to meet with Judith Van Velsor, Youth Faith Formation registrar, 770-205-7969, ext. 33.